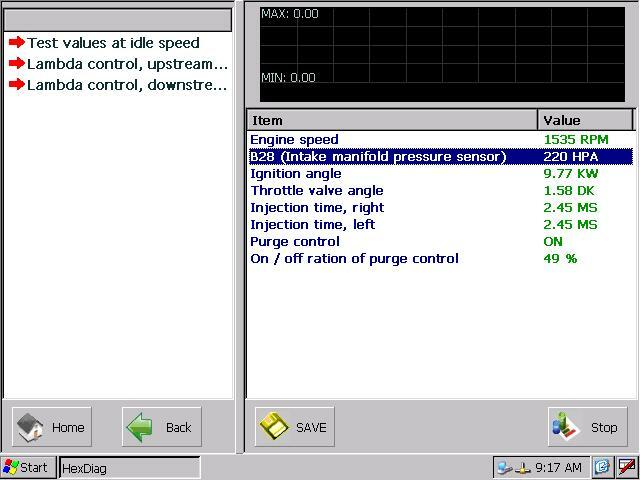 In AutoHex Scan Tool Mercedes Benz software displays live Data like Engine Speed, Battery voltage, Oxygen Sensor, Coolant Temperature, etc. or full listing of the actual values (all measured values). 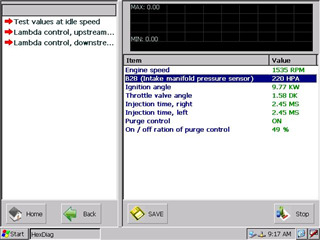 In AutoHex Mercedes Benz software you will get categorized actual value sub-menu. You will be able to select a category to see the actual values included. And you can save the Actual values selected by clicking (SAVE). Values can be displayed in graph, you will see graphic display; this will allow you to see the changes graphically on each value by clicking it, and to stop the graphical displaying click (STOP) button.